So, you have accepted your first invitation to speak at a conference. Well done. You are off the mark as a conference speaker. Now, in the time you have left before you give your speech, here are some conference speech tips. Because, no matter if your conference speech is at the Mobile World Congress, CES or your local trade association, you have to get it right. Understand Your Audience. Take some time to consider your audience at the conference. This shouldn't be tricky because your conference organiser can help. First of all they can probably give you a list of last year's delegates. Or, maybe a list of this year's attendees. You could go one step further. Speak with a colleague who spoke at the same conference last year. Assess their view of the audience. And, importantly, ask about their expectations. Finally, if there's an exhibition at the conference, grab a copy of the exhibitors list. That's useful, because you can always get more clues from that. Conference Venue. Be sure of the conference venue, its location, parking and other transport links. Re-confirm the date and time of your conference speech. You need to be practical. So, try to travel the day before your conference speech. Aim to stay overnight at a hotel local to the venue. Or, better still, stay overnight at the same venue as your conference. Because, you don't want to be late, unlike this Baroness Scotland speech at the Transparency International Event. Not so clear, in the circumstances. Practise. If your schedule has other demands, do make sure there are no time conflicts. Because that's the last thing you need as a conference speaker. Give yourself plenty of time for your speech. Plenty of time to plan and prepare. And plenty of time to both practise and rehearse. Do you have time to practise your conference speech with a colleague audience? Because if you do have the time, then speech practice is always a good plan. Have you scheduled a rehearsal with your conference organiser at the venue? If you haven't, now is the time to do just that. Because, first of all you want to be familiar with all the venue surroundings. And, second, you need to know about the sound system. And, last, you might need to practise with the venue's autocue! Your Conference Speech. Be clear about your conference speech topic, your speech title and the speech duration. Does the speech duration include questions? Since now is the time to check. You should aim for your conference speech to fit with the theme of the event. Because you don't want your speech to conflict with or duplicate another speech at the event. That's a nightmare. Time. Give yourself plenty of time. Because you need time between your acceptance of a speech invitation and the event itself. Preparation and rehearsals are always time-consuming. But you might also need to "clear" your speech with other managers, company directors or even shareholders. And, finally, you might need to give a copy of your speech to the organisers well before the event. Time is critical. Whatever the event, these conference speech tips should help you get ready for the important day. Good luck. 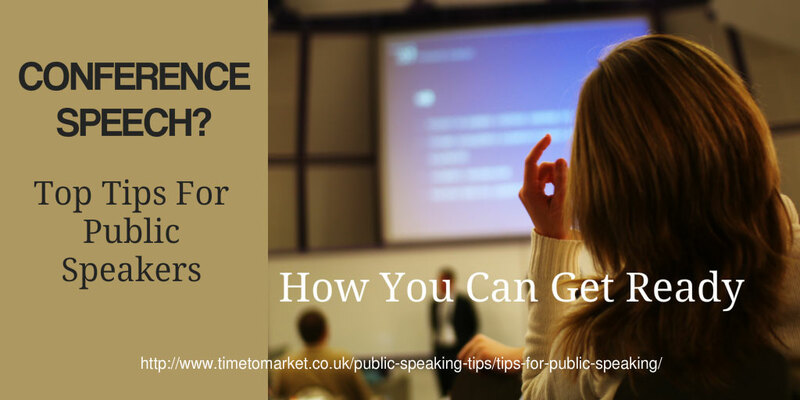 You can always discover more public speaking techniques with a public speaking training course or a coaching session. And because we use more than 40 training centres throughout the country, you are never that far from your nearest training opportunity. ​You can discover a whole series of public speaking tips from Time to Market. Read them, listen to the podcasts or watch the videos. And, when you want to give your own public speaking skills a further boost, please don't hesitate to consider some training or coaching. You can always contact us when the time is right. Please don't hesitate to get in touch for ​public speaking course advice.